For Fred, life has always been a marathon, not a sprint. In fact, Fred has completed 26 full marathons! As a competitive long distance runner into his 60s, a Vietnam veteran, and a devoted husband for 45 years, Fred is no stranger to hard work, commitment, and endurance. So, when Fred was faced with a diagnosis of ALS (Lou Gehrig’s disease), he approached it as a positive challenge. Fred had always been an active person from his time in the military to competing in weekly races as part of a running club. He joined the United States Army in 1967 and went to Vietnam in 1969 and served as an Infantry Rifle Platoon Leader with the 173rd Airborne Brigade. Most of his career was spent in Special Forces, which included dangerous and rigorous activities as a Green Beret. Fred was awarded two Bronze Stars, an Air Medal, two Army Commendation Medals, a Vietnam Cross of Gallantry, a Meritorious Service Medal, a Senior Parachutist Badge, and a Combat Infantryman’s Badge during his service to our country. He continued his active lifestyle outside of his military service by competing in hundreds of races to include 5Ks, 10Ks, half marathons, and full marathons. It seemed nothing could slow him down. Unfortunately, that all changed in 2008. Fred knew something was wrong when he started tripping and falling during races. He started coming in last when he had previously been the leader in his competitive age group. When he struggled to complete the 2006 Boston Marathon, Fred visited his doctor for answers. In 2008, Fred was diagnosed with ALS. Refusing to let this stop him, he received approval from his doctors to make one last scuba diving trip to the Cayman Islands with his long-time scuba partner. Then, determined, he began finding ways to remain independent, successful, and positive. He participated in clinical trials and began serving as a Consumer Reviewer on the DOD CDMRP (Congressionally Directed Medical Research Program) which reviews new proposals for research projects for treatments and therapies for ALS. Fred also spoke in front of the FDA in February 2012 to encourage them to speed up the process of drug and therapy approvals for ALS. Fred and his wife, Mary Jo, began attending support groups for those living with ALS and their caregivers at Johns Hopkins in Baltimore, Maryland. 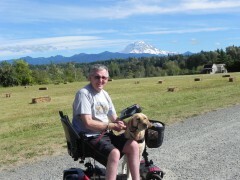 It was there that he learned about service dogs and what they could do to improve his quality of life. 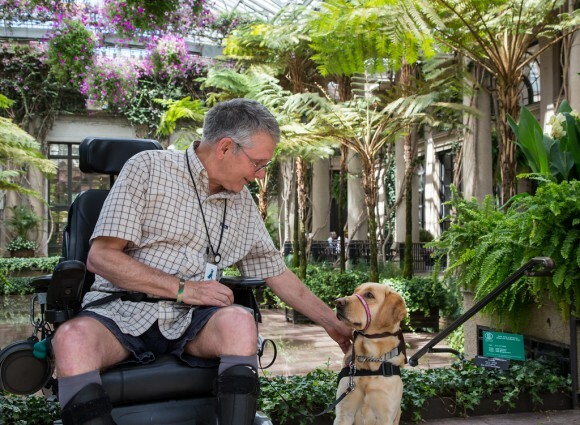 The Director of ALS Clinical Services at Johns Hopkins recommended Fred contact Canine Partners for Life for a service dog. She also put him in contact with a CPL graduate who could tell him about the experience. Andy, who also has ALS, was partnered with Snoopy in 2012. After talking with Andy and his doctors, Fred knew this was the right path for him. In the spring of 2016, CPL partnered Fred with Marlie, a beautiful blonde haired, brown eyed Labrador from the CPL breeding program. When Fred and Mary Jo arrived for Team Training in June, they were both a bit nervous. Some friends and family thought the dog would be a burden for Mary Jo, but Marlie quickly proved them wrong. Despite being the oldest member in his class, Fred bonded with the other students. He and Marlie came in each day smiling and tail wagging, embracing the day’s new opportunities to learn. Fred’s experience and wisdom were well respected by his classmates who were extremely interested in his tales of adventure and military service. Just as Fred gave his all to the military, he dedicated himself to creating a successful partnership with Marlie. The two learned something new each day in Team Training and continue to push themselves at home. Practicing obedience and skills every morning, Fred encourages Marlie by making tasks a little more challenging each time. Mary Jo said it all when she came to Team Training one day and told the class she’d heard the most beautiful words that morning: “I can do it myself.” The simple dignity that comes from being able to say those words is worth all the time and effort CPL graduates put in to their partnerships.